Call it karma fraud. Japanese law requires prospective tenants receive notification of a recent death in a rental unit, but it does not stipulate how far back that regulation applies. Goro Ikazuzi provides a work-around. He supplies a short-term resident to establish a buffer between future tenants and the deceased, rendering the flat “laundered.” His niece Mika Yakumo might either be the best or worst person for such a job, because she sees dead people. Usually, Yakumo resolutely resists any form of personal connection, but she will uncharacteristically find herself getting involved with two ghosts and maybe even a living human during the course of Kenji Katagiri’s Room Laundering (trailer here), which screens during the 2018 Fantasia International Film Festival. Yakumo’s father died when she was five years old and her mother mysteriously vanished a year later. It is now just her and angle-working uncle. He is a bit of a sleaze, but he seems genuinely protective of her. 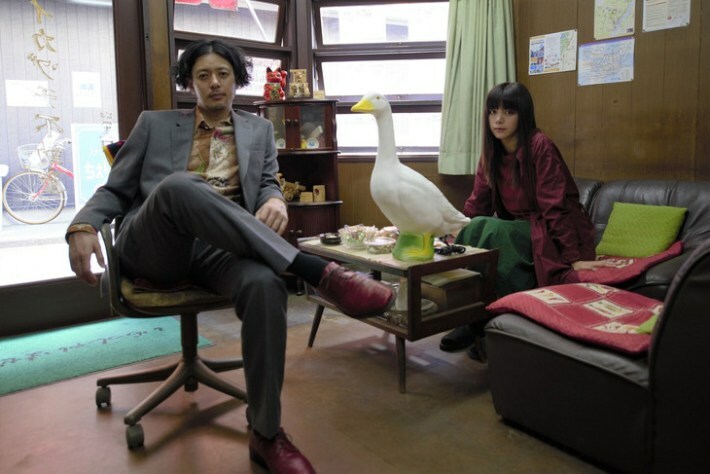 Most of the time, Yakumo easily ignores the ghosts in the apartment she launders, but she rather starts to enjoy the goofy personality of Kimihiko Kasuga, a punk rocker who now regrets committing suicide. In fact, she is somewhat sorry when she is reassigned to her next flat. This could be her toughest case yet—her first murder site. Yuki Chikamoto was a cosplaying business executive, who was brutally stabbed by an intruder. She would very much like Yakumo to help bring her killer to justice. Kasuga would too. Much to her surprise, he has also moved with Yakumo, because he is attached to an object she removed from his former home. There also happens to be a somewhat geeky but presentable young chap next door who is quite interested in Yakumo—again, much to her surprise. In many ways, Room Laundering is a dark film, but it also manages to be absolutely charming. Katagiri and co-screenwriter Tatsuya Umemoto never water down Yakumo’s emotional issues and anti-social tendencies, which is why it is so satisfying when she finally starts to come out of her shell. Fundamentally, this is a story about growing up and learning to process pain, but the room laundering premise and the attendant ghost subplots are wickedly clever. Elaiza Ikeda is terrific as Yakumo. It is a restrained and disciplined performance that never takes the easy way out, but still pays off in a big way. Likewise, Joe Odagiri is endlessly surprising as Ikazuzi. This isn’t his splashiest or most important role, but it is likely to become a fan favorite. Kiyohiko Shibukawa earns all kinds of bittersweet laughter as Kasuga, while former AKB48 member Kaoru Mitsumune is quite poignant as Chikamoto. First time helmer Katagiri takes his time establishing his characters and the rhythm of their lives, but his third act is an endlessly inventive parade of revelations. This is an undeniably eccentric film, but it should be described as soulful rather than quirky. Very highly recommended, Room Laundering screens again on Saturday (7/21), following its North America premiere at this year’s Fantasia up north.